I was watching a western one day and looked over to see this. 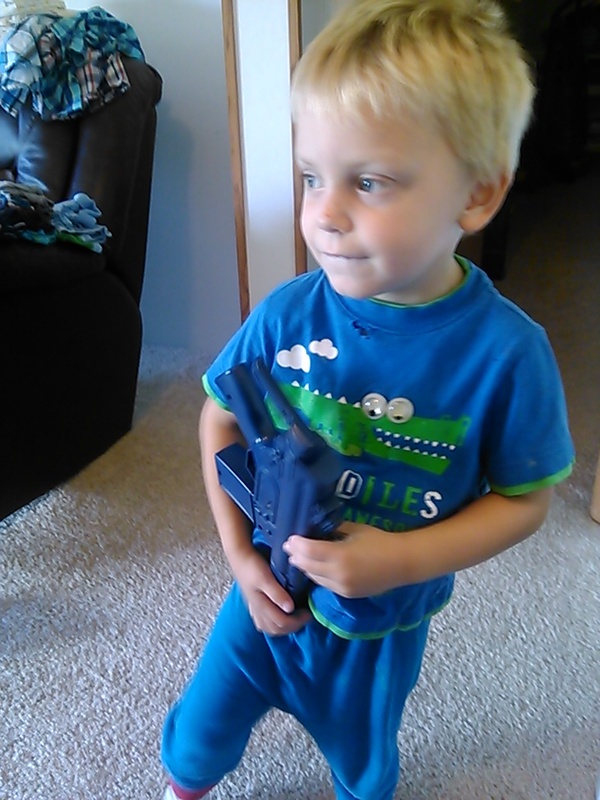 His gun is tucked in his waistband! Tru asked me to take this picture – little ham! Truett’s birthday is just a meer 6 days away. 3 years old. When did this happen? Seriously though. 3 years ago I was pregnant and worried sick waiting for my baby to come. And now my baby reminds me multiple times a day “Mommy, I big!” “I strong.” “I tall, mommy.” It’s such a beautiful thing to watch your child grow. It happens almost without me noticing and then one day I realize, he couldn’t say that last week… he couldn’t reach that a month ago…. these pants were falling off him last time he wore them and now they fit perfectly. What’s new with Tru? Hmmm, it’s more his personality developing that takes me by surprise all the time than anything else. He’s become even more snuggly and asks me to hold him several times a day. Even falling asleep next to me for a nap occasionally! This would have been almost unheard of last year. He talks a lot! He tries to sing occasionally. Sometimes he likes for me to sing, especially in the car and loves to listen to a playlist of Children’s Christian Music than I compiled from ytube. The “God song” is what he calls “This Is The Day”. If I tried to write down all the funny stuff he says, I’d be writing half the day! But when I sit down to write it on here, I can’t remember. One thing is, last night I gave Tru a haircut and he always says “I look yike a lion” when he needs a haircut because his hair stands straight up all the time. When I was cutting his hair he said “Now I look (like) a tiger!” He does know his animals! He’s always impressed us by pointing out animals and actually giving the correct names for them. Even ones that I’m not that familiar with! 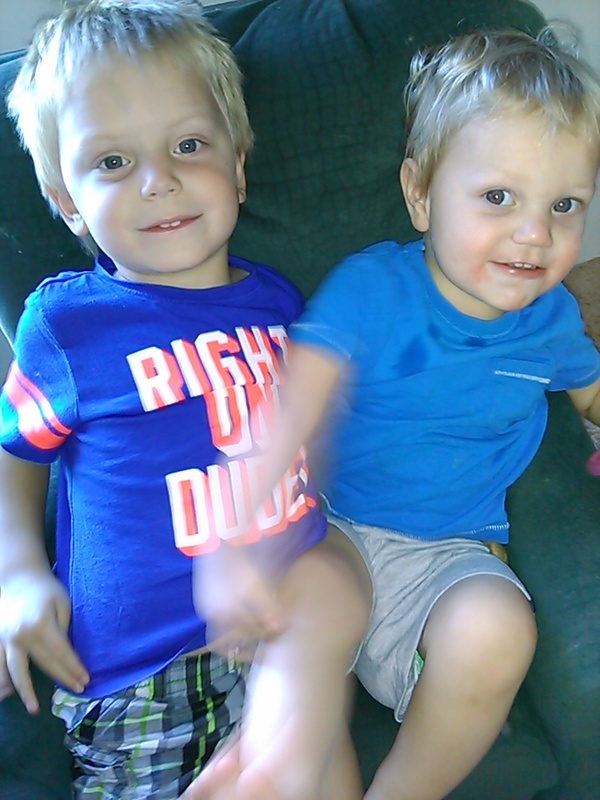 He used to watch a great deal of Wild Kratts and that is probably where he learned so many animals. He has such great retention! One more SS story… I was playing a game on my phone where you guess the logo with parts of it removed and Tru loves to watch. He saw the SS logo with the words removed from it and said “Look mom! Sesame Street!” I feel like he’s really smart but I know I’m crazy biased. Maybe our biggest struggle is his repeating when he’s angry. He will get stuck on something and keep saying it in excess of 25 times. It doesn’t matter how many different ways I try to explain why it won’t work or whatever and ignoring doesn’t work either. For example: Tru “I want ice, please.” (He is polite. Says please all the time) Me “We don’t have any ice. I’ll have to make some.” Tru “I want ice.” Me “See Tru? The trays are empty. We don’t have any.” Tru, crying and melting down “I want iiiiiiiiiiiiicccccceeee!! !” Repeat times 20+. The last few days I’ve started waiting till he’s repeated his request for whatever he wants (not usually ice, actually) about 5 times and then “Tru, if you keep saying ‘I want ice’ you are going to have to go sit in your bed.” It hasn’t really worked so far but I’m trying to be consistent. That’s not a good story to end on. I really feel like I can never capture in words how very loving this sweet boy is. Tru tells me he loves me all the time. He hugs Levi and tells him the same. He asks “God wuvs me?” at night when I put him to bed. 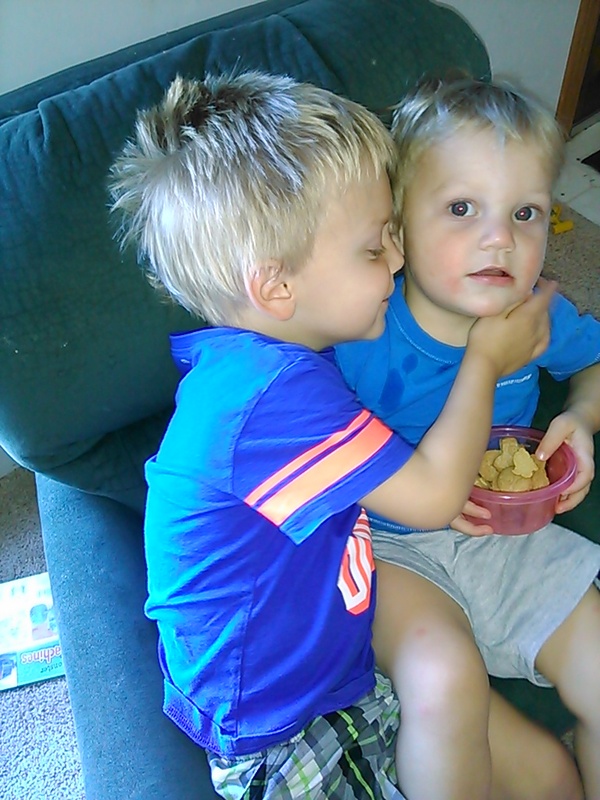 He tells me that he loves other people and is extremely fond of his aunts, uncles, grandparents and cousins. He keeps close tabs on them when they come over. My brother A was here last week and every time he left the room Tru would ask “Where’s uncle?” Tru was burning up with a fever at 4:30am and his only concern was still, uncle. 🙂 He’s just so precious. I am so thankful for the little person that he is and for God’s graciousness in letting me love him. A gift. He really lives up to his name; True Gift Of God. Dear God, thank you for these 35 months of loving and raising Truett. God I pray that You will help us to always raise him according to Your will and I pray that Tru will always know of Your love for him and love You all the days of his life. Please protect and watch over him. In Jesus’ name, amen. Self Potty Training – Is That A Thing? It’s probably too good to be true. I’m trying really hard not to get too excited but guys, Levi keeps going in the bathroom, taking off his diaper and asking to sit on the toilet. AND THEN (!!!) HE PEES! Yeah, I know. No way this is going to actually turn into an early potty training, right? He’s only 1.5 years old. And it’s not like he’s doing it all the time but it’s happened fairly often lately. Even over at my parent’s house. I know Levi wants to do EVERYTHING Tru does and he thinks this is way cool right now. 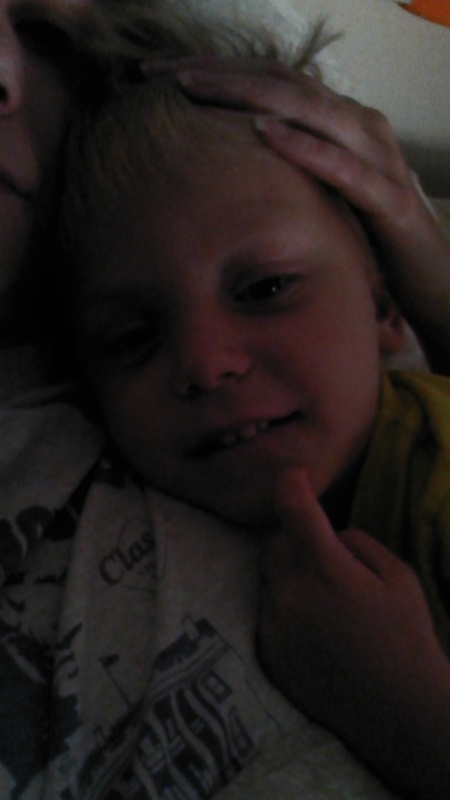 Fingers crossed he keeps it up and self potty trains. Because, AWESOME! Over the last 2 days we got all his results back. •Chest and belly xrays are good. Some distention from gas in his belly. He’s taking miralax now to see if that resolves. •Most of his blood work was perfect. He does have low iron (10.4) which is no surprise because he’s always showed low iron. We just have to add the iron supplement back in. •I don’t know what these results mean. His Dr wasn’t concerned about them from what the nurse told me: low lymphocytes %, high neutrophils, high alkaline phosphotase, low calcium. 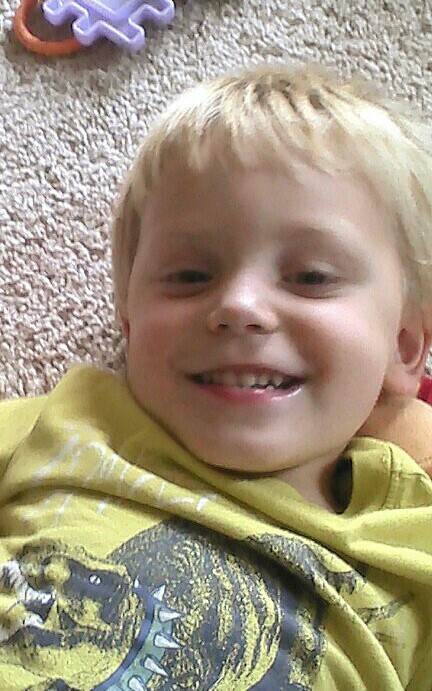 •His c reactive protein is high which is what prompted the Dr to refer Tru to rheumatology. From my extremely limited understanding , CRP shows inflammation in the body. •We are keeping a fever diary until his appointment. Basically we are just trying to rule out Familial Mediterranean Fever or some other Periodic Fever Syndrome. Both are not contagious. From what his Dr said, they are treatable. •His blood glucose was 144 which might just be high from the fever and the fact that he just ate but to be safe, we are supposed to check it at home 3 mornings over the course of a week. •always has high specific gravity which makes no sense because he drinks a ton. The Dr confirmed this with their tests. Normal during a fever but not ok when Tru is well. I’m to continue monitoring this at home. •recently drank so much one morning that he threw up. He has near panic attacks when he has to wait a minute or two for me to get his cup. •The Dr recommended that I buy a glucose monitor and check his blood sugar occasionally. I told him that I’d actually already checked it with a borrowed meter and his fasting sugars have been 114, 119 and 82. The Dr wasn’t concerned with these numbers even though the first 2 are a little high. We can just keep an eye on it from time to time. •Mostly we talked about the fevers which seem to be happening every 11 to 13 days or thereabouts. A few of them may have been actual colds but surely not all of them. •The Dr didn’t like how distended his belly is and the fact that it is often that way. He said to give him miralax and sent him for a belly xray. If that comes back good, he will probably send him for an ultrasound. •We also went for a chest xray while we were at it to rule out any problems there. •The Dr ordered a whole array of blood work on Tru, checking his liver function, immune panel of some sort and sedimentation rate amongst other things. I can’t remember all of them. I think it was 4 vials. •The rapid strep came back as a maybe faint positive. The Dr felt it was wrong so sent off a culture of that as well. •He is most likely going to send Tru to a rheumatologist after the blood work comes back. He suspects it could be cyclic fevers such as Periodic Fever Syndrome, which if I understand correctly, is genetic. And treatable. •We also talked about Tru’s belly pain which has been going on since may (?). He tells me almost daily and sometimes multiple times a day that his belly is “hot”. Which also means it hurts. I brought it up at his check up in July and was told to bring him in if it continued, which it has. 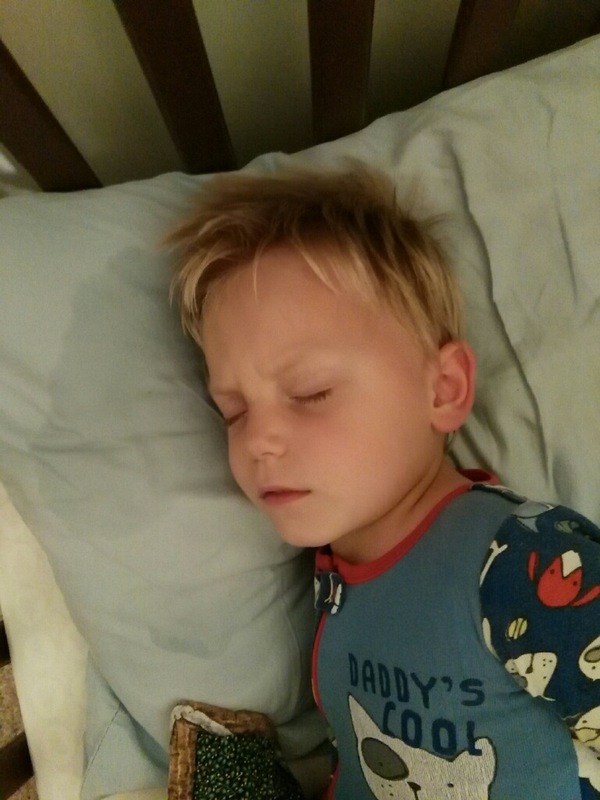 That is sweat on the pillow. Tru did great through the whole appointment, never crying even through 2 throat swabs, 4 xrays and the horrible blood draw. He really just wanted a turtle bandaid (TMNT) and loved his stickers. 😉 Everyone was shocked at how calm he was and I told the Dr that when I checked his blood sugar at home, he actually said “danks” (thanks) after I poked his finger. Hopefully we find something out in a few days that makes sense and is easy to treat. I’m definitely nervous and so is DH. It’s hard watching our little guy hurt and feel bad so often. Keep him in your prayers please. 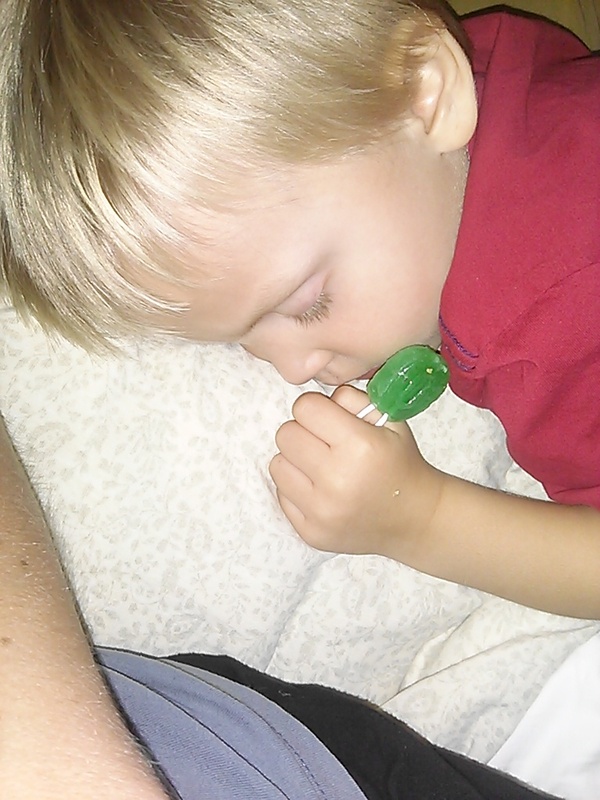 Fell asleep next to me with his sucker. Sweet baby. Truett gets fevers all the time. He calls them “beavers”. Sometimes I almost think he can sense one coming on. Lots of the time there are no other symptoms and no one else gets sick. Even though he often sleeps in our bed while he is burning with these fevers and Tru and Levi continue to share sippy cups all throughout the time Tru is *sick*. So they seem to be his own thing and that really concerns me. I’ve started tracking the fevers and I think now is the time to make him an appointment with his pediatrician. The intensity of the fevers is scary for me because they almost always go over 102° and have went as high as 105.8°. That I know of! 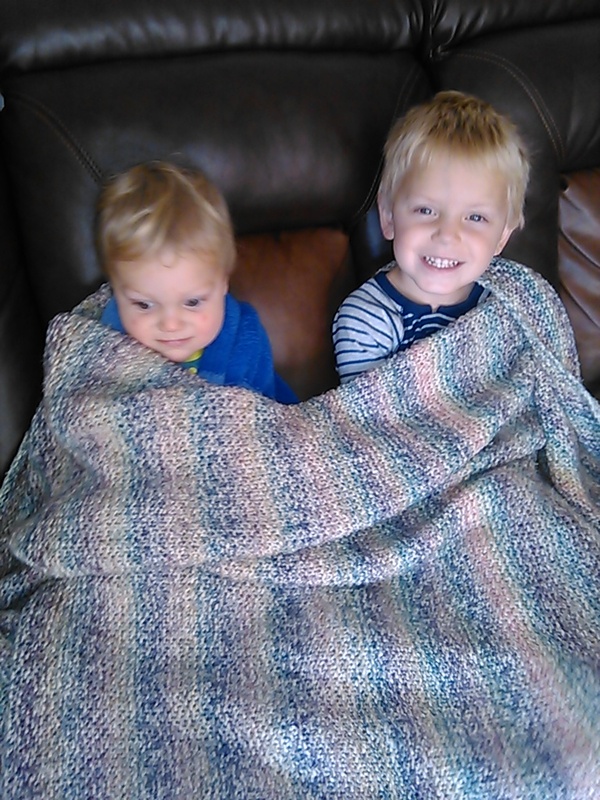 Tylenol usually does nothing for them and today ibuprofen isn’t helping much either. His temp was 103.8° today just 3ish hours after his last dose of ibuprofen. Aside from the intensity of the fevers, the frequency is really concerning. His last fever was just on sept 5th and it’s only the 18th now. I just don’t know what to think about this. So, DH has wanted a pig for years now. Yes, a pig. As in, oink oink. He talks about it pretty often and loves to look at all the pigs at the fair etc. 2 years ago at the fair. 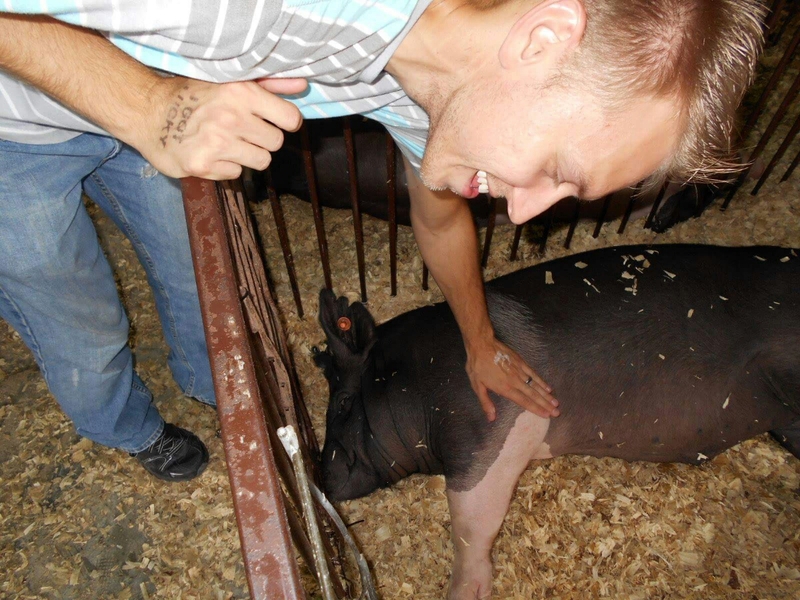 I mean, that is one happy pig-pettin man!